With encouragement of Ferry the founder, I joined the construction team since the third day on the Quinta. What a privilege it is to be able to participate in building the green roof, and finishing the interior of the new house! The green roof consists of layers of stones, earth and straws. It’s not green yet and it looks already awesome! We have been bringing earthen materials onto the roof with the tractor, spreading them evenly with shovels, and dreaming about the fairy-tale life the sheep and goats will have on it. The final step was seeding grass and throwing best wishes into the ground. Some good rainy days will come next week and I can’t stop imaging how the roof will look when it’s full grown. Cobbing, I’ve discovered my hidden talent of mastering it fairly quickly. On the first day, Nuño taught me the basics and I can’t remember when was the last time I became so enthusiastic about doing something as real as this. On the second day, Marlon taught me how to use tools, and I felt like a chimpanzee who has just discovered the convenience of technology and was simply overjoyed by the skyrocketed efficency. By throwing and spreading cob with the tool, the whole process went much quicker, cleaner, but it also feels less like giving birth.. I guess this is how it was when humans first entered the industrial age, when they first started to use steam engines and weaving machines. Quicker, cleaner, easier, and less attentions and emotions. 7 am, I got up and was immediately greeted good morning by a gang of African guinea fowls just outside the door. I went left, cuddled a bit with Lulu the wolf dog (!) on the driveway, and saw the treehouse (!) under the stunning sunrise (!). I almost lost my breath already. After some magical moments, I went back and had breakfast with Ferry the founder, Nicolette the musician, Frank, Matt and Marie the fellow volunteers. All together we did a short yoga session to kick-start the working day. I started with some mindful weeding in the greenhouse while Frank was watering the mango trees, orange treelings and broccoli seedlings. We empty four planting boxes so I can plant something new to commemorate my first day. I went through the seed drawer and found five special plants that I immediately found connection with. Fully satisfied, I went back and joined Matt to collect goat and sheep manure. Five minutes later, we were approached by the creators of the holy shits. We gave some good sweet nice-to-meet-you carcassing to Snowy the baby goat (!!) and Mecca the pregnant mama goat (!!). Then we went back to the food garden and spreaded the whole basket of manure onto five raised beds. On top of the manure came a layer of mulch and the raised beds were ready to be home for some seedlings from the greenhouse. While working, Matt showed me the duck house he made by the small pond, and Frank explained me the whole system of the garden: Water from the big pond flows to the small pond, where the ducks will live and poop. Thanks to the ducks, the population of slugs and snails will be nicely controlled; Thanks to the poops, the water will be very nutritious which we will use for watering the raised beds. I sparked smiles from my eyes and couldn't believe it can be so beautifully ingenious. In the meantime, the horses have passed by three times to show off their gorgeous bodies and hairs. Then was teatime, during which we sat down with Nuno and Marlon the construction workers, who came to help building the big house. It will become the permaculture learning centre in the future. In that house, Marie has been spending her entire week cobbing, to bring shape to an amazingly beautiful bee house in a tree. After the short break, we went back and Frank taught me how to thin down and spread out the beetroots seedlings, in order to prevent unnecessary competition. That was very delicate work. One wrong move and you'll be killing babies. I dedicated my entire concentration, care, time and love until it's lunchtime. Today it's Marie's turn to cook. She nailed it so flawlessly, no one could stop saying thank you! After lunch I went to clean the treehouse so I can move in tonight (!!!). Nicolette and Marie had warned me that it can get cold during the night. So I brought my thick sleeping bag, warm socks and boiling heart with me. After the cleaning we took the bikes and cycled to Lydia's the local bar for some internet. The ride takes 10 minutes. 5 minutes within the Quinta itself, 5 minutes on the public road. On the way back home, the sun set and burned the western sky to red. I had to stop many times, just to watch and let the whole scene burn into the back of my eyes. Before dinner, Nicolette sat beside me, talking while knitting. I told her thousand things I love about this place, including her knitting. It reminds me so much of my mom, of the timeless time I sat next to her and just watch. And how she never could finish the whole sweater, only had to persuade me to wear her sleeveless love. Jim and Ryo, the boys, took turns on computer to play Minecraft. While Ryo appreciated his 30 mins game time, Jim went to bring Batman inside, the cool yet gentle rooster. That was my first time to touch a live chicken and its glamorous feathers, without any agitation and fear from both sides. After dinner, bed time. I went back to the treehouse with my torch. I was a bit afraid when crossing the field with hidden brambles in the dark. Also the torch light was creating a perfect atmosphere for a horror film. I heard myself whispering: It's only nature. Everything happens here is only natural. Life and death, just love and embrace it. In May 2016 we volunteered at ‘A Quinta’ in Alentejo, south west of Portugal and not too far from the coast. A project with 130 hectares of beautiful land that is being restored through permaculture practices and regenerative agriculture. This farm consists of a small community of residents and volunteers, has many examples of the permaculture systems that we hope to use in the future, and was a great learning experience for us both. Originally, this was not an area we were going to explore for Keela Yoga Farm. However, that changed during a chance meeting with a friend of a friend from Hong Kong at our Portuguese school in Lisbon. She invited us to stay at her yoga retreat and farm on our way down to Algarve that weekend and we were struck by the beauty of the area almost immediately. We decided to look into volunteering in Alentejo after our stay at Osho Gardens, which brought us to A Quinta. When we arrived at A Quinta we fell in love with it straight away. As we drove onto the land, we could see the refurbished ruin in the distance surrounded by fields and trees. We passed by free range chickens and guinea fowl, quite a few ponds and a large vegetable patch. We were greeted by a lovely couple from the UK who were also volunteering and they showed us around the property making us feel really welcome. We learnt so much at this farm. I worked mainly with an ecologist from the UK, called Bruce who was staying there and helping with the permaculture designs. He shared his knowledge about keyline design, reforestation and ecology with me. As per my previous soil blog, our focus as gardeners should be on the microorganisms in the soil to ensure we have healthy plants in abundance as nature intended. Without the bacteria and fungus thriving, the plants won’t be full of healthy nutrients and minerals that they need, and what we need in order to be healthy. Bruce taught me how he manages the microbiology within soils which I will bring to Keela Yoga Farm. Although the project is only a couple of years old, it already has an established community feel with everyone taking turns to make the meals, do the washing up or the cleaning. During the day everyone gets on with their jobs which were mainly digging swales, paths and helping to regenerate the life in the soil in a planned food forest and building. I also helped with an outdoor sink, building a polytunnel arch out of canesh (a cane like bamboo found in Portugal) with the local builders, clearing brambles, helping another volunteer to make a beehive, making a grey water cleaning system and of course cooking and not avoiding washing up. In our free time we would hang out together in the communal areas, walk down to the local cafe for wifi or continue our search for land with the local estate agents. Kimberly worked with a building team to put the finishing touches to the exterior of the main house. She learnt how to mix cob in the different consistencies needed at various stages in order to create window and door frames, and a bench. She got to start and finish a project which was a great learning experience. We hope to have as much experience as we can with natural building techniques so that we can apply them to our own place in the future. Cob can be worn down by weather however, and needs replacing or maintained more often than traditional building techniques but the materials can be sourced locally and on your own land bringing building costs and global impact down significantly. They had everything on site from chickens to goats and horses running free on their 130 hectares of land. Their overall aim for the project was to regenerate the land through key lines, microbiology and sustainable animal management on the pastures and build an education centre to teach people about permaculture and sustainable living. We learned so much from working with all the different volunteers as everyone had different skills which they brought to the farm. 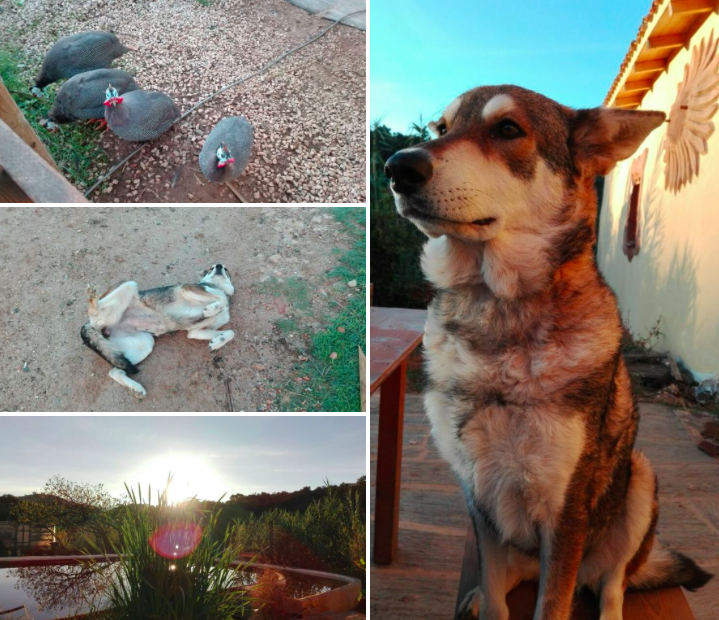 A Quinta is a wonderful place and I would recommend volunteering there if you are in to permaculture, sustainability, animals, nature and do not mind basic accomodation. It’s been said that “good farmers understand the value of well-tilled soil…and the dangers of over-tilled ground”. Soil compaction, resulting in what is commonly called a hardpan, has been recognized as a potential limiting factor in crop production since farmers transitioned from horse-drawn plows to heavier tractors and more aggressive tilling strategies in the early 1900’s. From a wildlife manager’s perspective, where planting food plots has become “standard practice” on most properties, it is important to learn and understand farming techniques and soil management practices. Doing so will not only help you grow successful food plots to enhance the wildlife value on your property, but will help you get the most out of your time, efforts, and money. Subsoiling is a soil management strategy commonly used by farmers to minimize soil compaction and maximize crop production, but also has application when managing quality food plots for wildlife. However, subsoiling is often overlooked and/or misunderstood by many food plot managers. In my travels as a wildlife consultant, I work on properties across the country and routinely see food plots where the manager has “planted by the book”, meaning they have properly amended the soil to ensure desired pH and adequate nutrients are available, prepared a smooth seed bed, and planted seed under ideal conditions, yet as the crop matures it becomes distressed or stunted. In many cases, the hunter/manager doesn’t recognize the ”underlying” problem because these plots produce respectable crops and generally do well until roots reach the compacted soil or the plot experiences a dry or wet period resulting in stressed or dead crops. More times than not, the culprit is an unseen layer of compacted soil lying slightly below the surface of the ground. Under these conditions, food plots are producing forage but do not experience optimal growth, or in some cases fail, essentially cheating the manager (and wildlife) of results for their efforts. By identifying and addressing soil compaction problems, managers can significantly enhance the growth and survival of a food plot allowing them, and the wildlife they are managing for, to gain the maximum benefit from their efforts. Soil compaction results in a densely compacted layer of soil that lies between the topsoil and the subsoil. This compacted layer is often called “the hardpan”. Generally speaking, depth of hardpans vary with soil type and farming strategies but are often 4 -12” below the surface of the soil and are caused by the weight and pressure of tractors (and other equipment) on the soil and repeated disking/tillage over several years that loosens top soil. This causes the finest particles of soil (clay) to migrate downward, accumulate, and bind creating a very dense layer. In food plots, we commonly find hardpans 6 – 8” below the surface of the soil, which is coincidentally the depth most harrows plow/break the ground. It may help to imagine the hardpan as a layer of concrete below the surface of the soil. As you would expect, water and oxygen do not travel well through hardpans, thus during periods of excessive rainfall, water may lie in puddles on the surface of the hardpan then evaporate before it can seep down into the deeper subsoil. In some cases, standing water deteriorates and kills forages before it evaporates. Similarly, during periods of low rainfall, topsoil of food plots that have a hardpan dries out quickly because of its inability to draw moisture from subsoil resulting in stressed or dead crops. In my experience, the tell-tale sign of soil compaction issues is when food plot crops respond quickly to, or appear very sensitive to either a mild drought or significant rain event. That is, the food plot appears to get very dry or very wet easily, causing crops to stress. As such, these are usually the first food plots to start showing signs of drought during a dry period. Because soil compaction occurs below ground and out-of-sight, it is more difficult to detect than many other more obvious factors affecting forage growth and production. The old saying of “out-of-sight…out-of-mind” certainly holds true here as many managers don’t even think about it. Hardpans can be easily detected in food plots using a soil probe, which is a 2 – 4’ metal rod – sharpened on one end to penetrate the soil, and a handle on the other end to assist in pushing the probe through the soil. You can make a probe out of rebar or purchase one from a forestry supply company for about $75. The best time to check for hardpans is when the soil is not extremely wet or dry. Insert the probe at various locations across the food plot. As the probe is inserted, the force required to move it through the soil should remain about the same unless a hardpan is reached. Upon hitting a hardpan, it will take much more effort to push the probe. It is important to understand that a “natural pan” normally exists between topsoil and subsoil layers of most soils, which will cause some resistance when probing the soil. This is the area where these two layers merge. However, a true “hardpan” will be very obvious as it is much more densely packed and harder to penetrate with a probe. From my experience, hardpans in food plots are often 6 – 8” below the surface, which is the depth at which most disks plow, and may be 2 – 10” thick, depending on soil type and age of the field. Also, hardpans can sometimes be detected while plowing a field. Because a hardpan is…well…hard, disks of a harrow will often bounce as they hit the hardpan. In some cases, disks may bite into the hardpan and bounce along the hardpan causing the tractor to jerk. These fields begin to get “wavy” as you ride across them due to the bouncing of the harrow while plowing. Although this is not a technical method of detecting a hardpan it is something good to know if you experience this in your food plots while plowing. Breaking the hardpan is often referred to as “subsoiling”, which breaks up the soil to depths of two feet and fragments layers of compacted soil allowing water and roots to penetrate into the subsoil. While there are a handful of different implements that can be used to subsoil, a subsoiling chisel plow – simply referred to as a subsoiler – is the most common. Subsoilers do not invert or turn the soil like a moldboard plow used to prepare the field to plant; they are simply very heavy duty steel shanks tipped with blades that drive deep into the soil and are pulled along to break the hardpan below the surface. While some soil is brought to the surface as the subsoiler is pulled along, the only evidence of disturbance on the food plot will be small trench-like furrows or lines left by the shank(s) of the subsoiler as it passes through the soil. As you can imagine, subsoiler plows cause significant soil drag and require a tractor or dozer with at least a 50 horsepower engine. A good rule of thumb is 10-15 additional horsepower is required per shank on a chisel plow. Most plows have 1-5 shanks that are set 9 – 12” apart. If you do not own a subsoiler, many companies rent them. Due to the significant soil drag and horsepower needed to subsoil, which results in burning a good bit of tractor fuel, do not pull the subsoiler any deeper in the soil than what is needed. Deeper means more fuel which means more money. As previously mentioned, hardpans are normally 2 -10” thick. When assessing hardpans with a soil probe, you should be able to determine the thickness of the hardpan. As you push the probe into the soil, you will feel pressure as you reach the top of the hardpan. As the probe pushes through the hardpan and into the subsoil, the effort needed to push will be significantly less. Note the depth at which pushing gets easier as this will be the bottom of the hardpan and the depth you will need to set the subsoiler when plowing. Keyline plowing uses a subsoil plow method with a very flat plow shank (about 8%) to slice through the soil and create channels below the surface slightly off contour. These channels help break up soil compaction, create a place for new roots to grow with less effort and direct water more easily. Compost tea or EM can be inserted directly while plowing to optimise the process. Keyline methods enable the rapid development of deep biologically fertile soil by converting subsoil into living topsoil. Keyline pattern cultivation enables the rapid flood irrigation of undulating land without terracing. Incidental results are the healing of soil erosion, bio-adsorption of salinity and the long term storage of atmospheric carbon in the soil as humus. For more articles on wildlife management topics such as food plot, tree planting, predator control, fertilizing and liming, soil tests, supplemental feeding, fish stocking, weed and grass control in timber and ponds, timber thinning, and many others visit Wildlife Trends. They offer bi-monthly issues from wildlife managers and biologists that help you take the guess work out of your land management. Dragon Dreaming is a way of putting creativity and inspiration into projects to make them successful. That can be any kind of project, a small one, like a household recipe or a big project like building an eco community. It’s about turning dreams into reality with a group of inspired people, and making it into a success. Weaving the indigenous wisdom of the Aboriginal peoples of Western Australia with Joanna Macy’s Deep Ecology and his own unique life experience and style, John Croft reinvented a way to find the path between a dream and an outrageously successful project. In today’s world, we grow up being told that we’re ridiculous when we’re sharing our dreams – “wishful thinking, illusions, impossible”. But the Aboriginals believe, like many other spiritual groups, that knowing and accepting our dreams, we actually know what will happen in the future; in telling our dreams we’re creating our future. There is a lot to Dragon Dreaming. Too much to go into detail, but I will explain my impession of it in short. There is the Dreaming part, with someone’s dream/idea which starts it all off. Then when the dream is completed, it moves into the Planning stage, where plans are made to realise the dream. The third part is the Doing stage, where the dream is brought into reality and the last phase, and by no means the least, is the Celebration stage. The process of Dragon Dreaming starts with an individual and his/her dream, which is the first phase. This is my favourite part. It is when the dreamer, the one who comes up with the project idea or vision calls in a Dreaming Circle. The dreamer tells his/her dream to a group of selected people. The Dream Circle starts when he/she has told his dream, lets go of it into the circle and from here, the talking stick moves around and everybody is invited to speak and express what the project should include for them to be involved in it. (Inviting a child is also a great idea, as children often think way outside the box.) As the process goes on, people get inspired by each others dreams/ideas and start to dream together and an enormous amount of creativity starts spinning into the air. By letting go of the dream into the group, the dream ultimately becomes bigger and more interesting. And because each member feels inspired and thus attached to the dream, it becomes every ones dream to make it into a success. The planning starts in the second phase (‘Projects never plan to fail, they fail to plan’). So the group starts feeding into the project/dream and the project feeds back into the individual. Research has shown that 90 % of all our dreams, never become theory; 90 % of the theory is never really planned; 90 % of the plans are never put into practise; and 90 % of our projects never get older than 3 years. From there the process moves into the third phase, the doing. The theory developed feeds into practise. A lot of projects, especially in our modern culture tend to spend all of their time in planning and doing, never really feeding back into the dreams of the individuals involved, therefore not really being satisfying to anybody and unsustainable. To make the cycle complete, we therefore find a fourth stage: the celebration. The celebration is the phase where the project feeds back into the individual, where there is time for reflection, adjustments, reconsideration of wants and needs, new dreams and visions to start the cycle anew and let it expand like a spiral, starting small and adding experience as it’s moving forward. I found it very inspiring to see a dream/idea transform into something even bigger and better, to which all the participants could relate and feel a motivation to make it succeed. To let the dream flow. This is important, as nothing in life is static. Everything changes and flows, and a certain degree of chaos is needed to keep it alive and adjustable. Another interesting part is that there is no general leader. As each phase requires a different kind of person to lead the project. The dreamer is usually the leader in the dreaming phase, but often not so good in planning/doing/celebrating. In a natural way someone else tends to take over the leading role when going into the planning phase, and again in the doing phase and celebration phase. This way each person in the whole group has an important equal role, feels responsible and motivated. Which leads to each person experiencing personal growth along with a successfull project.